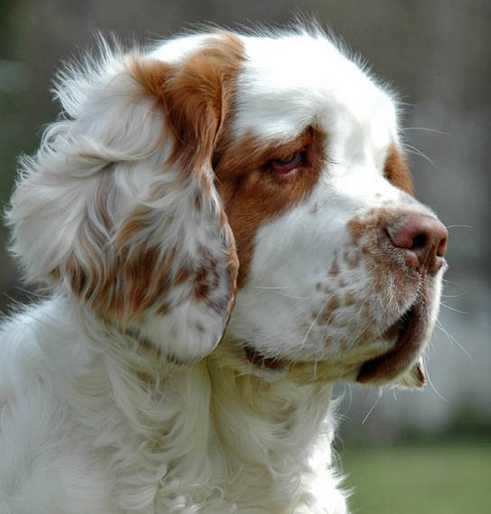 The most interesting story to come out of the Crufts 2012 debacle is the story of the Clumber Spaniel, Chervood Snowsun. What makes it so interesting are the lies and the lying liars who tell the lies about this dog. In the immediate aftermath of the DQ, the owner called for an interview with the dog fancy’s Pravda organ, DogWorldTV. In the interview, she explicitly said the dog didn’t have ectropion. I’ve been attacked for saying that this woman denied ectropion. She’s not a native English speaker, so she may not have understood the word. And that may have been. But if you watch the video all the way through, the actual Clumber Spaniel Club in the UK comes to the defense of the dog and says there was no ectropion. That is, the owner is not the only one lying. The club is, too! And this lie became obvious when someone managed to snap a photo of the official document describing Chervood’s Snowsun. If you have a hard time reading the hieroglyphics of the veterinary profession, it clearly says this dog has bilateral ectropion. You’d think that would stop the lying, but it did not. On the Monday after Crufts, another lie came filtering its way through the paranoid natterings that have been filtering around online with the various Facebook groups that are out there claiming to be in defense of purebred dogs. The dog was taken to a vet, and the dog’s eyes turned out to be normal. So it must be that the dog was healthy after all, and it was the card-carrying PETA member vet that caused the DQ. Um. Wrong. There was no mention of the condition of the dog’s eyelids on that form. It turns out that the whole thing is one giant piece of misninformation and lying through omission, as Chris over at BorderWars points out. This lie is added to with another claim that this breed has passed its BVA/KS/ISDS eye scheme tests. These tests never look at the eyelids. There is no document that shows that this dog’s eyelids had ever been examined, except by the judge at Crufts. So we have a perfect example of the owner of the dog making huge claims about how healthy this dog is because the breeder did all of 5 tests which looked at 3 joints (hips, elbows, knee cap), a limited survey of the eye, and one DNA exam for Exercised Induced Collapse. The owner then gets caught at Crufts with a dog that has ectropion. Instead of admitting that the dog has this condition, as do many Clumber Spaniels, they lie and say that it does not have ectropion and that they have an exam result to prove it. But they are lying through omission. You can’t pass a health check you never took in the first place! There is no document, other than that from the vet at Crufts, that shows that anyone has ever looked at her eyelids. This is a lie through omission. 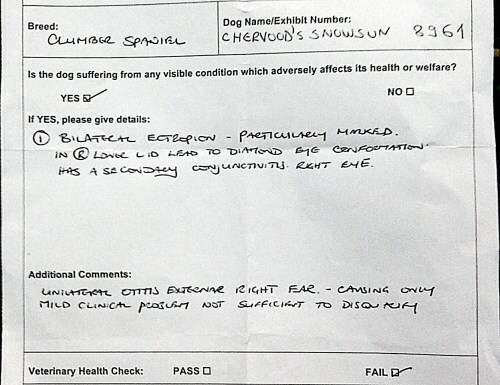 Most of the public doesn’t know that the check doesn’t examine the eyelids, so they assume that a document that says the dog is fine is somehow proof that the vet at Crufts unfairly targeted this dog. If people are willing to lie about this dog and this condition, just imagine what sort of lies and misrepresentations are going with the other DQ BOB’s from this year’s Crufts? At the highest level of the sport under the greatest scrutiny you can imagine, a top flight breeder will still LIE through her teeth about what those health tests mean to deceive the public. Ectropion is not a joke, but neither is it a deeply held shameful secret. It’s widespread in several breeds and it’s easily diagnosed just from looking at most dogs with it. If the best of the best don’t have the stones to say “it’s epidemic in the breed and we’re willing to work on it, so what if we don’t win a ribbon for a few years while we try” then what can we expect them to say about the diseases which aren’t so superficial, aren’t so easy to diagnose by the public without benefit of breeder disclosure, and aren’t known to be so present in so many lines. What about all the other diseases and conditions that have no test? That’s the vast majority of them. Will we still believe that the dogs these people breed are healthy when we have no data one way or another? Will we still accept their dangerous breeding practices, the ones that increase disease expression, when they claim to have healthy dogs because they have some results for a half dozen tests or less? If they are willing to pretend that a simple eye exam clears their dogs of conditions which they know their dog does have but which the test does not actually cover, what other diseases will they knowingly cover up with such claims. This owner is clearly using other people in the fancy, who are coming to her defense with this faulty information. I don’t know if the Clumber Spaniel Club members actually know the truth or if they are also being used in this manipulative scheme. I would be highly surprised that they wouldn’t know the truth, and if they are, they are lying and manipulating people, too. So if you’re going to defend this dog and her owner, you need a little stronger sauce than these tests and that vet report. If you can produce a document that says the eyelids are fine, you win. If you cannot, then you know you’re being lied to. And you should be angry with her and the Clumber Spaniel Club, not Crufts and not the Kennel Club. All of this self-righteous indignation about the DQ’d BOB’s at Crufts is really getting old. The anger is being misdirected at the real culprits in this whole mess. Paranoid rants about animal rights activists coming to take your dogs simply won’t cut it. Every lie that is told about this dog or any of the others is further evidence for the animal rights lobby to present the dog owning public that the dog fancy is morally bankrupt and/or insane. The way the dog fancy is handling this issue is proving it to be an entitled, selfish subculture that cares far more about nylon ribbons than it does about dog health. That’s just about a step above Michael Vick in the eyes of the pet-owning public. It’s very hard to make rational arguments about anything, because people already think your either evil or insane. So think about this when you write these paranoid little comments on my blog or those of others. When you look at the dog in the film, she clearly has ectropian in both eyes, that is the lower lids hang down, exposing the inner eyelid. The dog probably always has some conjunctivitis due to the exposed inner eye. This is superficial, as uncomfortable as it is, compared to having a breeding population of less than 100 individuals in many breeds. They may have thousands of dogs in a breed but if the effective founding population falls under 100 individuals contributing genes, the breed is going extinct, whether the breeders know it or not. It will breed itself into extinction if new DNA is not put into the breeds with small founding populations. I hope you cover this problem, too. on April 14, 2012 at 11:53 am M.R.S. The definition of ectropion in Gelatt’s standard reference on veterinary ophthalmology defines ectropion as an outward rolling or eversion of the (lower) eyelid. Thus the inner surface of the eyelid is exposed. By that definition, a lax or drooping lower lid that leaves the’ third eyelid’ (haw, nictitating membrane) visible is not by itself considered ectropion, if it does not have the outward rolling. That is not to say that such a condition need not be considered to be a problem.